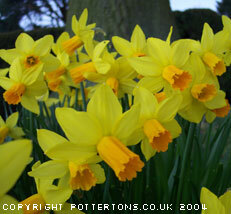 Daffodils announce the arrival of spring & play an essential part in most garden plantings. 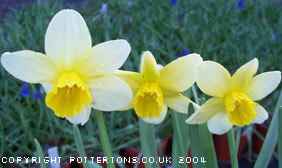 We offer a mixture of the true dwarf & many of the smaller garden worthy hybrids. They are best planted in clumps or used for naturalising in grass etc; the dwarf varieties are most suited on a rockery, raised bed, border or in pots. 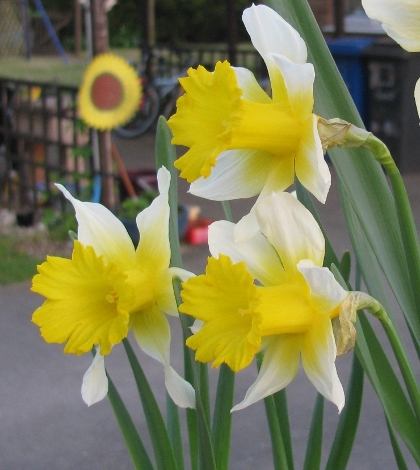 Large daffodil bulbs should be planted at 15cm depth and the smaller ones at 7-10cm. Very limited availability. 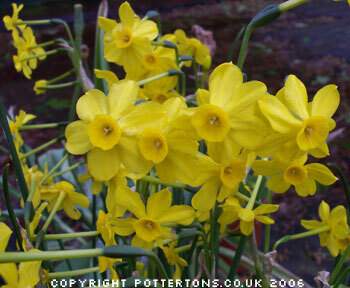 A true miniature daffodil with solitary, fragrant rich yellow flowers, 10-15cm tall in March. Erect glaucous, short leaves. Ideal subject for a trough. One of those plants that despite its small stature bring great joy to your heart. Suitable for trough, raised bed or well drained rockery. The best & most floriferous Hoop Petticoat that reliably produces five or more bright golden-yellow flowers per bulb in mid to late April, 20cm, good for naturalising in rough grassland or in an open garden situation. 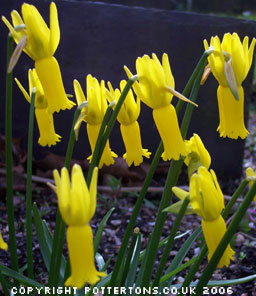 Dwarf form with large deep yellow flowers on short stems to about 10cm in April. Hardy for a well drained soil in sun ie trough, raised bed or rockery. 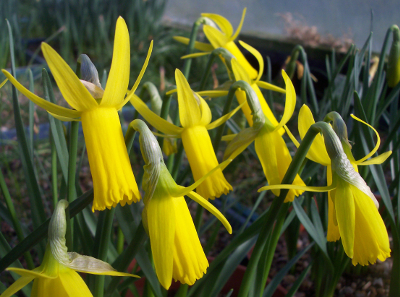 We are delighted to offer again this lovely miniature with narrow, funnel shaped rich yellow flowers to 12cm in March to April. For a sunny scree, raised bed or large trough, limited availability. 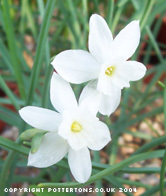 Large conical, soft creamy-white flowers on tall stems up to 15cm in December and January. Cultivate in pots or plant in a warm, sunny sheltered well drained alpine garden. A true gem, dwarf trumpet flowers of golden yellow with distinct petals swept backwards, on stems to 15cm in March, well drained rich acid soil that should not dry out in summer. Named by my late father this was one of his favourites, graceful simple yellow flowers like an enlarged N. cyclamineus up to 25cm in April, this has proven to be an excellent, robust garden hardy and worthy plant, long-lived. Strong, robust form ideal for withstanding winters weather with bold yellow flowers on 25cm stems in mid February, very hardy. Large white petals with a bright yellow trumpet, 20cm tall. 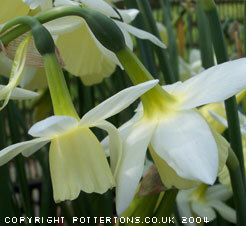 A very popular Daffodil with beautiful milky-white petals and lemon trumpet fading to creamy-white. Another favourite with beautiful & distinct large, reflexed golden-yellow flowers with a bright orange trumpet in March, 25cm. 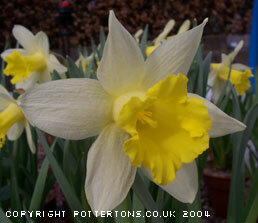 A superb daffodil, very closely resembling the species N. cyclamineus but larger in all parts. Long stout trumpets golden yellow, no more than 20cm tall, fully hardy. Probably the finest of all the cyclamineus hybrids, excellent for pot culture or garden where it is equally long lived. Lemon-yellow petals with neat orange trumpets. 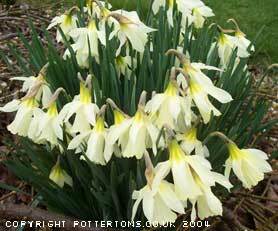 Long trumpets of pale lemon turning to cream as the flower ages, light yellow trumpet, 20cm tall. 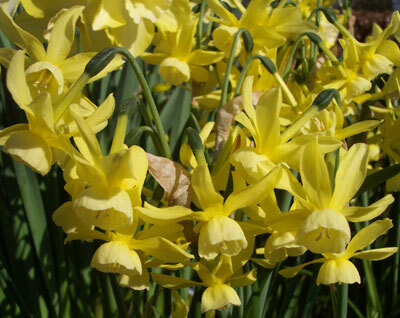 Deep golden-yellow multi-heads of sweetly fragrant flowers on 15cm stems, mid March to April. 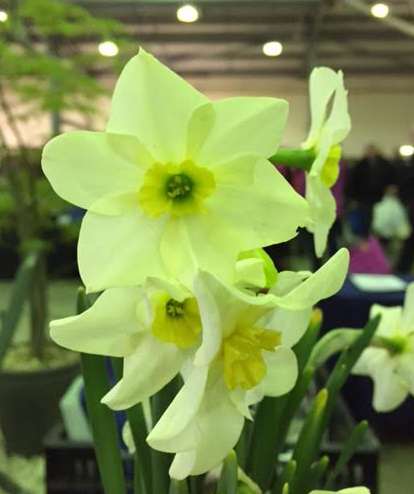 Delightful and distinctive pale yellow flowering miniature daffodil, darker yellow at the base & tips of the tube, on 7 to 12cm stems in March. Hardy in a well drained soil, for a raised bed, large trough. Very unusual and distinctive miniature species with almost sessile mid yellow flowers and low narrow dark green leaves. 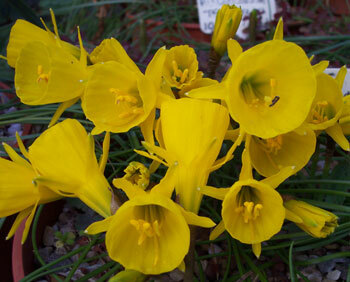 Due to its size probably best grown in a pot for cold frame or select a choice spot in the alpine garden or trough. 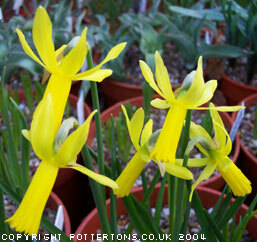 Soft yellow, sweetly scented and very free flowering form, 20cm tall. New introduction which offers a fabulous sweet fragrance, large white flowers, a yellow cup and prominent green eye, hardy. Lemon-yellow flowers with a white centre, from the middle of April onwards, 20cm. Beautifully rounded straw-yellow flowers and tiny golden yellow cup, 15cm. 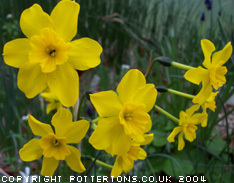 Three to five deep rich yellow fls per 25cm stem, sweetly scented, March to April, hardy. A rarely offered miniature raised by Alec Gray, a much smaller version of the similar shaped flower ‘Sundisc’ with vivid yellow petals & a slightly darker cup, 15-20cm tall. This new hybrid produced their multi-headed dark yellow flowers from January to April this year, 20-25cm tall, outstanding. Creamy-white drooping flowers, tinged with pale yellow, 20cm tall in April. 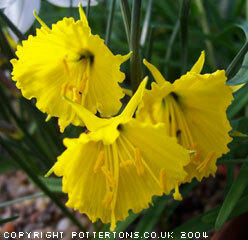 Very similar to the unobtainable legendary Narcissus alpestris in form. 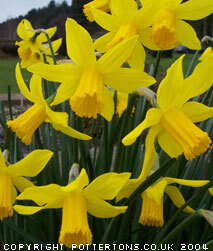 This is a really beautiful daffodil, which each year looks quite spectacular in our display feature garden. Outstanding species - petals are pale yellow suffused with darker yellow on reverse, trumpet golden yellow with deep notches at the tip. A distinct and seldom offered species from the high Pyrenees, slightly nodding flowers reach about 25cm high. Well drained rich loam in an open sunny situation. A strong growing recently introduced Hoop Petticoat that reliably produces many sweetly scented, deep golden-yellow flowers on erect stems up to 25cm, hardy. Unusual & distinct form with fully double large yellow flowers on relatively short 15cm stems in April. The full flowers look more like roses than daffodils. 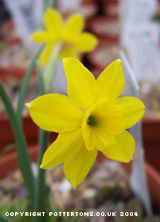 A good dwarf daffodil with bright yellow flowers and an elaborately frilled trumpet to 15cm in March. Large trough, raised bed or scree. Lovely early flowering dark yellow flowers to about 10cm in January. Long 5cm, hoop petticoat type, white flowers on 15 cm stems from November to January, pot culture in an alpine house or cold frame. 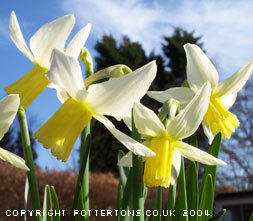 Large creamy-yellow flowers on 10-15cm stems January to February. Pristine white flowers with shallow saucer-shaped cups on stems to 10cm in March to April. Spectacular miniature species from the North African Atlas Mountains which we cultivate in pots in a cold frame, although hardy in warmer climates. A natural wild hybrid with many two or three rich-golden yellow, fragrant flowers per stem, up to 15-20cm tall. 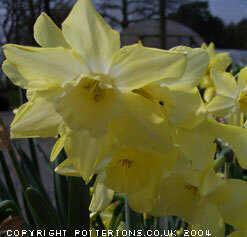 An excellent, sturdy dwarf bicoloured daffodil, creamy-white petals, pale lemon trumpet from March-April. Relatively short stems to 15cm which seems to make the flowers look even bigger and bolder. 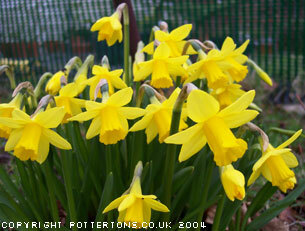 Usually 3 to 5 flowers per stem of soft lemon-yellow coloured flowers, strong 15cm stems, April. Up to six golden-yellow flowers on a 15cm stem. One of the best with 4-6 pendulous flowers on a spike, clear lemon-yellow with reflexed perianth on stems to 20cm in mid to late April. 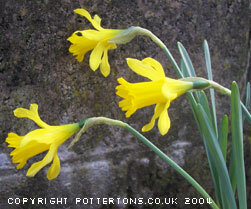 A good colour break from the norm - two or three nodding lemon-yellow flowers in April on stems to 30cm. A welcome new addition to any garden. A lovely rarely offered miniature triandrus hybrid, soft yellow reflexed petals and small creamy-yellow corona, up to 4 flowers per stem. 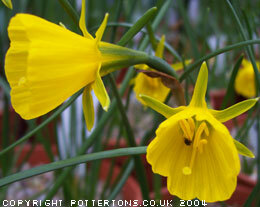 One to three stems per bulb of very small deep yellow flowers, full sun garden situ.